Sustainable landscape practices – healthy plants, healthy planet. Promoting clean water and soil. Biodegradable fertilizers, pest controls and weed controls are safer for people, plants and animals. We always select the safest available option for each situation. We use organic pest controls as much as possible. 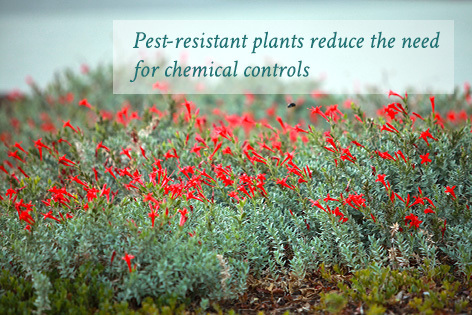 Pest-resistant plants reduce the need for chemical pest controls. We keep landscapes clear of debris, reducing rodent nests and the need to eliminate them by chemical means. Targeted pest controls – we never “blanket-apply” pest controls. We target only the areas needing control, keeping pesticide use to a minimum. Hand and mechanical weeding is used wherever possible – reduces the need for herbicides. Erosion control – we use landscape barriers during construction projects to prevent soil runoff into gutters and streams. Reducing landfill waste by recycling. We “grasscycle” with mulching mowers – recycles grass clippings by shredding them into compost and putting them back into the lawn. Mulching puts nutrients back into the soil and reduces the need for fertilizers by up to 30%. We send green waste to a mulching facility – saves landfill space and recycles green waste into mulch and soil amendments. Container recycling – we recycle all plastic and wood containers. 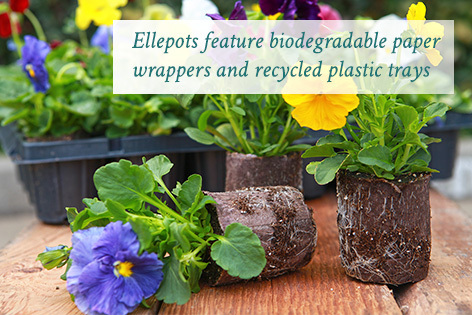 Biodegradable containers for annual plantings are made of recycled cardboard and wood materials. We use recycled products as much as possible – plastic header board, mulches, wood products, etc. We plant trees to shade parking lots and buildings – shade cools the area and reduces building energy use and reduces the heat island effect. Pruning helps control temperatures – we prune trees to maximize shade in the summer and sunlight in winter, helping buildings and paved areas stay cooler in summer and warmer in winter. Sparing the air with efficient, low-emission equipment. We use only low-emission power equipment – and only when necessary. We upgrade to more efficient equipment as soon as it becomes available. On Spare The Air Days, we do not use combustion equipment.